Katherine joined Search from Kelly Services as a managing consultant for Office Services in 2000. Over the years she progressed to divisional manager, associate director and director, before taking up her current role as Managing Director for Commercial and General Staffing in 2017. Katherine’s UK wide remit covers all recruitment across the Call and Contact Centre, Office Services, Hospitality and Catering, Industrial and Aviation industries. 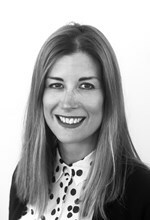 She oversees an experienced team of 180 specialist consultants across the UK. A key area of current focus is the implementation of a national development plan for delivering service excellence to Search’s major clients across the UK. She has been instrumental in the winning and retention of many of Search’s key accounts and is passionate about developing new divisions and expanding our verticals to enhance our service offering to clients. As a long serving member of the Search management team, Katherine feels that Search’s strength lies in the passion and commitment demonstrated by the company towards its employees, encouraging and developing them to give the very best service they can to clients and candidates.